With seven years of experience as a full time ceramic artist, Ashley Crumley is known for her hand painted, depth full underglaze work. Crumley’s subjects range from porcelain doll parts to hand crocheted doilies reminiscent of the fine, treasured crafts and hobbies of a bygone era. 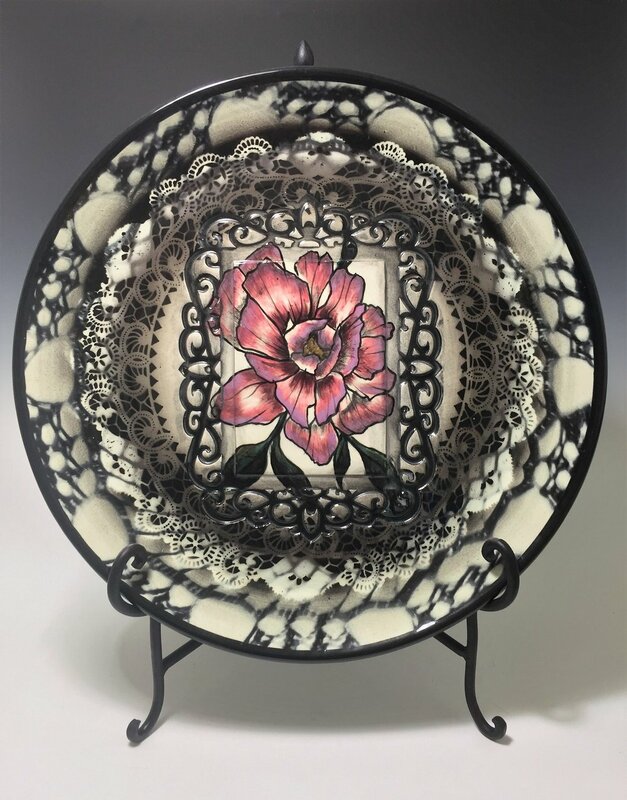 Crumley alters the societal notion of these antiquated art forms by taking and re-imagining them into the home as contemporary functional dinnerware and decorative pieces. Ashley Crumley began her career as a full-time artist after graduating from college with a BA in Art Education. That year, Ashley began working as a production potter and painter for Roger Allen Pottery, at The Chicken Farm Art Center, in San Angelo TX, and opened her own studio and gallery there in 2012, two years later. Ashley now lives and works in Corpus Christi, TX where she has a home studio and travels throughout the year to art festivals all over Texas.